Class A pads are our extreme duty track pad. In most cases this pad is too aggressive for the average DE driver but is reserved for extended enduro type racing. For DE and sprint type races we recommend that drivers first try the E class pads before considering these. These are Race Pads and they are Extremely Noisy. Not for Street Use! "A" compound provides immediate brake response without warm-up. It provides excellent cold friction for qualifying laps or restarts after long caution periods. As the temperatures increase, the friction values settle in and remain consistent over the entire temperature range. Regardless of temperature, engagement is always smooth with excellent modulation characteristics at low or high pedal pressures. Release is always quick and clean. The driver can confidently go deep into the corners with consistent response and without upsetting the car. 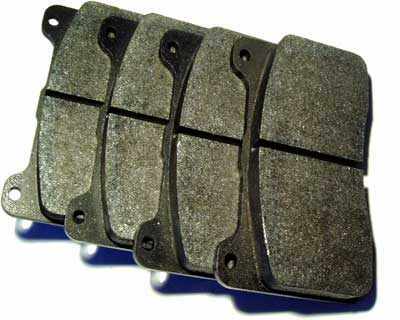 No other friction compound can deliver this kind of stopping power over such a wide temperature range under the most extreme conditions. "A" compound is fully compatible with all cast iron, high strength steel, and titanium racing rotors. It reaches peak performance after one high temperature bedding cycle. During the bedding cycle, a boundary layer of friction material is transferred to the rotor faces. The boundary layer further improves overall stopping power and helps to reduce rotor abrasion. It also reduces engagement chatter from uneven material build up on the rotor faces and contributes to a quick and clean release. On titanium rotors, "A" compound maintains fade free performance and long wear despite the fact that the titanium rotor does not draw any appreciable amount of heat out of the pad. The uniform thermal transfer characteristics of all PolyMatrix compounds will minimize hot spotting and heat checking. Rotor life is ultimately extended over other hard or abrasive brake pad compounds.